Ward SNG satellite services in Japan adopts ATEME video contribution solution. Paris, August 2014: ATEME, a global leader in advanced video compression solutions for the broadcast industry, has announced that Ward, Inc., a provider of satellite services in Nara, Japan has selected ATEME’s Kyrion™ CM5000 and is the first satellite services provider in Japan to adopt ATEME’s contribution technology to support the worldwide broadcast of sporting and other events. Ward, which provides satellite coordination, Satellite News Gathering (SNG) and earth station services, works primarily with foreign broadcasters so it is critical that they use encoders that support a variety of frame rates, resolution and compression formats. The CM5000 addresses all uses cases of IP and Satellite Contribution within a unique platform and delivers support for all MPEG-2/MPEG-4 video compression standards and profiles. 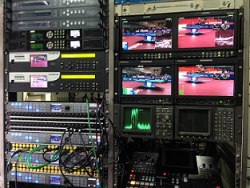 Ward’s SNG vehicles have limited rack space and the company uses multiple encoders to uplink to two or more satellite paths simultaneously, all of them redundant. Ward considered the built-in DVB-S2 modulator in the same 1U space a bonus when choosing the Kyrion CM5000. The company's SNG operators prefer operating from the front panel of the device from within the vehicle and found the Kyrion CM5000 menu operations to be highly intuitive. The company was also impressed with ATEME’s strategy of incorporating customer feedback in the development of its products.